CRYSTAL Palace has sacked Frank de Boer after just 77 days as manager, with Roy Hodgson set to replace him at Selhurst Park. The Dutchman, who succeeded Sam Allardyce in June, lost all four of his Premier League games without scoring, the worst start of any top-flight club in 93 years. The Eagles dominated in a 1-0 defeat at Burnley on Sunday and De Boer hoped an improved performance would save him, but on Monday morning he was confirmed as the shortest-serving Premier League manager in terms of matches and said he was "disappointed about the decision". It is understood Hodgson is set to sign a two-year contract as his successor and bring in Ray Lewington, who worked with him for England, as his assistant. But what they will be tasked with is unclear, after De Boer had been appointed to revamp Palace's style of football and make it more effective in possession, mirroring Ajax, where he won four Eredivisie titles. 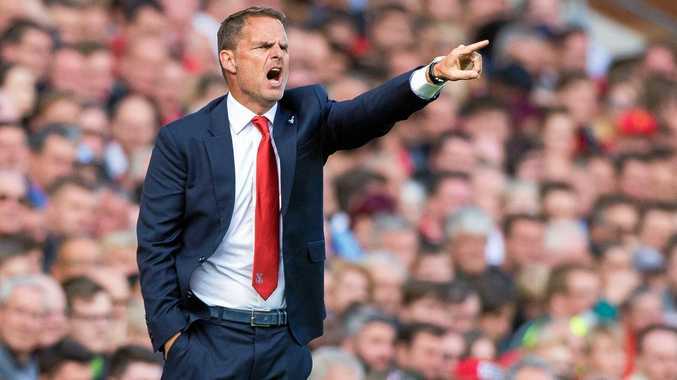 De Boer had vowed to fight and said he was "convinced" it could achieve its objectives, but Palace issued a statement that read: "Crystal Palace have parted company with Frank de Boer. Meanwhile, Sam Allardyce has ruled himself out of the running for a return to Crystal Palace, who revealed on Monday Night Football that he spoke to chairman Steve Parish on Monday afternoon. "To make it clear for everybody and to stop the speculation, I spoke to Steve late this afternoon and said I wouldn't be ready to come back," the former Palace boss told MNF. "I made a decision and I wouldn't feel comfortable taking any position as a football manager because I'm enjoying my life at the moment and enjoying watching everyone else deal with the pressures of the Premier League. "There's certainly huge pressure - more pressure than ever - in the Premier League as we've seen by Frank going so early."